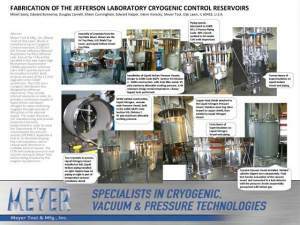 Fabrication of the Jefferson Laboratory Cryogenic Control Reservoirs - Meyer Tool & Mfg. Meyer Tool & Mfg., Inc. (Meyer Tool) of Oak Lawn, Illinois is manufacturing six Cryogenic Control reservoirs (CCRs) for the Thomas Jefferson National Accelerator Facility (Jefferson Lab). Five of the CCRs will be installed in the new Super High Momentum Spectrometer (SHMS) planned for Jefferson Lab's Hall C and the sixth will be installed in Hall D. Both projects are part of the 12 GeV upgrade to the CEBAF accelerator. The CCRs are a cryogenic distribution box designed by Jefferson Laboratory. They include internal reservoirs in order to provide a continuous supply of liquid helium and liquid nitrogen to superconducting magnets through periods of disruption in the external supply. This paper discusses the manufacturing and process measures that were implemented in order to meet the Department of Energy requirements for pressure vessels (10CFR851 Appendix A Part 4), to eliminate brazing flux contamination, and to reduce weld distortion in multiple internal vessels. The CCRs will undergo pressure and vacuum testing at Meyer Tool before being installed by the magnet manufacturer. Meyer Tool & Mfg., Inc. (Meyer Tool) of Oak Lawn, Illinois has been contracted to manufacture six Cryogenic Control Reservoirs (CCRs) for the Thomas Jefferson National Accelerator Facility (Jefferson Lab). The CCR is a cryogenic distribution box which services a single superconducting magnet. The Cryogenic Control Reservoirs consist of an inner helium dewar (volume 80 liters) surrounded by a coaxial liquid nitrogen dewar (volume 55 liters). Liquid helium and liquid nitrogen are supplied through standard Continuous Electron Beam Accelerator Facility (CEBAF) 1.5" bayonets, and cold helium is returned through such a bayonet. A fourth bayonet supplies helium gas at 300K to 80K. This allows the cool-down of the magnet at a controlled rate by using cold helium gas. The liquid helium and liquid nitrogen piping is located in the annular space between the helium and nitrogen dewars. Incoming liquid helium is fed to two standard CEBAF Joule-Thompson (JT) valves. The "top fill" valve feeds liquid helium to the CCR dewar space while the "bottom fill" valve supplies liquid helium directly to the magnet dewar. These two dewar spaces are connected at the base of the CCR. A helium return JT valve regulates the pressure in the dewar. Similarly, the flow path for incoming liquid nitrogen splits to feed a "top fill" JT valve which supplies the liquid nitrogen vessel in the CCR and a "bottom fill" JT valve which directly fills the magnet liquid nitrogen shield. The magnet liquid nitrogen shield and the CCR liquid nitrogen vessel are also interconnected at the base of the CCR. A sixth JT valve is used to regulate the flow of 300K-80K cool-down gas. The custom JT valve operators are also being assembled at Meyer Tool. These operators are a redesigned version of Jefferson Lab's standard JT valve operator. It includes provisions to apply an adjustable and reproducible closing force on the valve and to protect the valve from over-travel with both limit switches and mechanical stops. Copper heat shields are attached to the liquid nitrogen space and surround the liquid helium space and the region in which the liquid helium spaces of the CCR and the magnet interconnect. The possibility that corrosive flux from silver soldering the heat shields would later lead to leaks in stainless steel piping was a concern of Jefferson Lab. To comply with the requirements of the Code of Federal Regulations 10CFR851, the vessels were to be designed, fabricated, and tested to meet the requirements of the ASME Pressure Vessel Code. However, the vessels are not stamped and the customer fills the role of the Authorized Inspector. Specifically, for the helium and nitrogen vessels, the material certification and traceability, the weld process specification, welder qualification records, weld inspection requirements, material testing requirements and pressure testing requirements are to meet code requirements. Similarly, the piping was required to meet the Process Piping code B31.3 with the provision that impact testing for the piping would be per the pressure vessel code. In the absence of code requirements, the testing of these vessels would consist of cold shocking and leak testing welds and verifying the electrical connection of temperature sensors. A final overall helium mass spectrometer leak test, involving the pressurization of the helium and nitrogen circuits, would be performed to demonstrate that the helium vessel and the nitrogen vessel were free of leaks to the dewar vacuum space. Additional NDT is required to meet code requirements. Jefferson Lab designed the CCRs to Section VIII Division 2 Alternative Rules of the pressure vessel code, 2009 edition. Most pressure vessels are designed to the Section VIII Division 1 rules, which are more prescriptive. Division 2 allows somewhat greater flexibility, but imposes additional design analysis and NDT requirements. In many instances the two sets of rules are very similar. In both Division 1 and Division 2, pneumatic testing is allowed in cases in which introducing water into a vessel would be undesirable, as is the case here. In Division 2, Paragraph 8.2 deals with hydrostatic testing and Paragraph 8.3 deals with pneumatic testing. The corresponding sections in Division 1 are UG-99 and UG-100. Paragraph 8.3 requires that the vessel be pneumatically tested to 1.15 the MAWP. This is slightly higher than the Division 1 requirement of 1.1 times the MAWP. In this case the MAWP was specified to be 95 psia for both the helium and nitrogen spaces. The vessels are tested to 109 psia with the vacuum space under full vacuum. The pneumatic test also constitutes a leak test because the vessels are pressurized with helium with a helium mass spectrometer leak detector connected to the vacuum space. The weld filler metal is 316L. The weld filler metal has a ferrite number of not more than 5. These conditions were met and Impact testing at -196°C (77K) was performed on the LHe vessel base, top and shell base metals, on a weld sample and on a heat affected zone sample. In addition to applying the pressure vessel code to the liquid helium and liquid nitrogen vessels, the piping internal to the CCR was required to meet the ASME B31.3 Process Piping code. However, meeting the impact testing requirements of the piping code would require impact testing of the liquid helium piping at the service temperature. It was determined that applying the impact testing requirements of the pressure vessel code to the piping would ensure an equivalent level of safety in a practical manner. As the pressure vessel code limits the impact test requirement to thicknesses about .090", the 0.065" wall thickness, 0.75" IPS Schedule 5 pipe used in the liquid helium piping makes it exempt from impact testing. The Jefferson Lab design was based on a weld efficiency of 0.85. From paragraph 7.4 and Table 7.2 of the Division 2 code it was determined that dye penetrant testing of a sample of six welds would satisfy the requirement that 10% of the welds be inspected by dye penetrant testing. The dye penetrant tests were performed by Meyer Tool to internal procedures. All visual weld inspections on the liquid helium vessel, the liquid nitrogen vessel and the piping were conducted by one of Meyer Tool's Certified Weld Inspectors. The examination requirements of the piping code were applied to welds on the outer vacuum vessel. Section VIII Division 2 of the pressure vessel code requires visual inspection of all welds (paragraphs 7.4.1.1 and 7.5.2). The B31.3 piping code specifies that a sample of the welds be examined by radiography or ultrasonic testing, but allows visual inspection to be substituted for radiography and ultrasonic testing (Paragraph 341.4.1 – 2006). Written test reports were prepared for all visual weld inspections. In order to meet the pressure vessel code, all welding on the liquid helium and liquid nitrogen vessels must be performed by welders who are certified to Section IX of the code per the certification tests and requirements stated in Section IX of the code. Welds must be performed to a Weld Procedure Specification (WPS) which has been qualified as documented by a Procedure Qualification Record (PQR). Each welder will have a Welder Procedure Qualification (WPQ) to certify proficiency for a particular weld procedure. The piping code also requires welders and welding procedures which are certified to Section IX of the Pressure Vessel Code. When the MDMT of a vessel is below -196C (77K) then the type of welding permitted is restricted to SMAW, GMAW, SAW, PAW or GTAW. If a vessel is to be built to the code, then the design of a weld, and therefore its execution, are also affected by code requirements. This will often mean full penetration welds, which can greatly increase the problems of distortion due to welding. If a vessel is not actually to be code stamped, then this is one area in which some compromises may be made to improve manufacturability while not negatively affecting safety. Fabrication of a vessel to meet code requirements also introduces additional record-keeping requirements. In addition to documenting welding procedures and welder qualifications, as well as the results of all required testing; the materials used in the fabrication of a pressure vessel must be documented. For a pressure vessel, the Certified Mill Test Reports (CMTRs) for materials which are under stress due to pressure must be obtained. The Mill Test Report includes the composition of the alloy as determined by an assay and the results of mechanical tests performed on a sample from the same batch or "heat number". The CMTRs for items which are welded to the pressure vessel (such as mounting brackets) must also be obtained in order to demonstrate that these materials are suitable for welding. Whether fabricated to the pressure vessel code or not, there are always challenges when fabricating vessels of this type. The all welded construction of these vessels provides for reliable, leak-tight operation. However, it is necessary to ensure that the vessel is leak tight at each stage of fabrication to avoid extensive rework. We cold shock welded joints by a liquid nitrogen spray procedure and then leak test using a helium mass spectrometer leak detector. The liquid nitrogen spray procedure results in a more rapid cool-down than would be obtained by immersion in liquid nitrogen. When fitting together vessels of this type, distortion caused by welding can make assembly difficult. Tubes and pipes from the liquid helium space, for example, must match openings in the top of the outer vacuum shell. While it is possible to fit and weld each section of the vessel together in place, this can be inconvenient for the welder (upside-down welds) and make it difficult to perform intermediate leak testing. We found that, with care, the vessels could be tacked together in place, removed and welded on the bench, and then installed in the vessel after cold shocking and leak testing. Bracing and clamping tubes and pipes to maintain their relative positions during welding aided this. The heat shields can also distort badly when TIG brazed or welded. Tacking small areas at a time spaced around the perimeter helped to avoid significant distortion. The CCRs contain piping in the relatively narrow annular region between the liquid helium vessel and the liquid nitrogen vessel. This piping connects the bayonets, JT valves, liquid helium and liquid nitrogen vessels and bottom fill lines. In the past, to fit piping into a complicated and restricted three dimensional space based on two dimensional CAD drawings, the piping would be fit in place. The CCRs were designed using a three dimensional model. We found that significant portions of the piping could be welded on the bench and then installed. 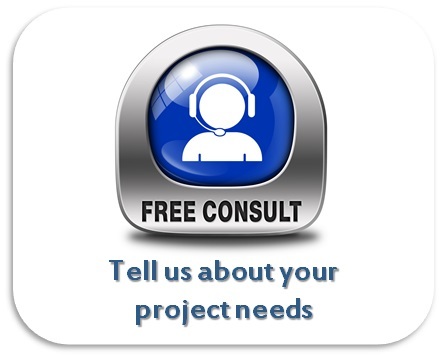 This saved a great deal of time because fabrication of the piping could proceed independently of the vessel. ​The first CCR was delivered in July 2010 and has been used to test a superconducting magnet. Two additional CCRs were completed in January 2011. Through correct choice of fabrication techniques and non-destructive testing, the use of certified welders and approved welding procedures and proper record collection and retention, Meyer Tool is fabricating the CCRs to meet the requirements of the ASME Pressure Vessel Code and the Process Piping Code. Through the careful choice of assembly techniques, and adding some additional steps when needed, the copper heat shields have been joined to each other and to the stainless steel liquid nitrogen dewar without corrosive brazing flux remaining in the vessel. This project will be completed with the delivery of three additional CCRs at the end of 2011.